How about ausgrp, noble n Midas? Sorry to ask so many questions. Thanks in advance. 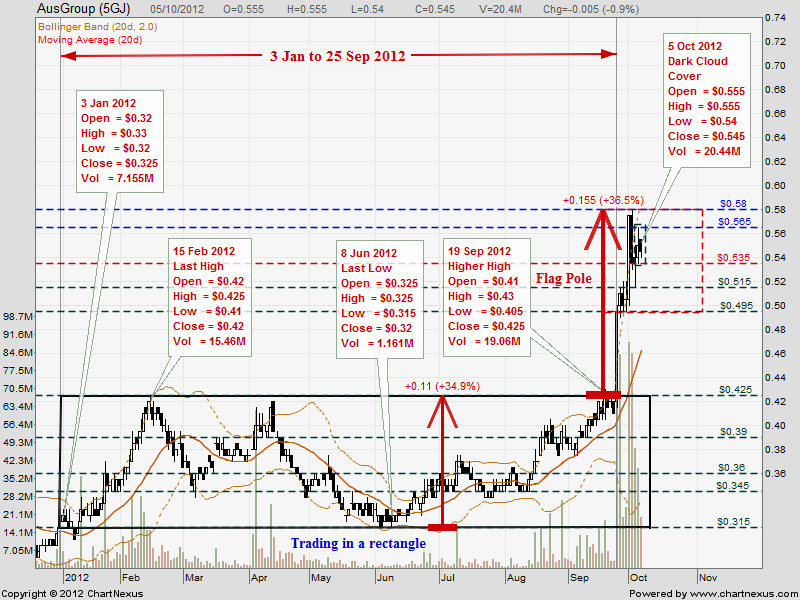 AusGroup is a mining and oil & gas services stock, it'll remain weak after dead cat bounces/technical rebounds, i.e. 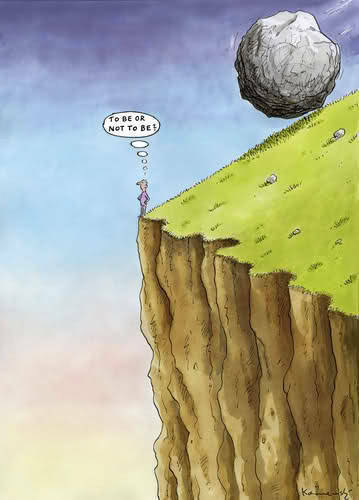 the downtrend is sustainable. 1st appearance of a long black marubozu in Ausgroup's chart; expect more downside than upside. AusGroup closed at day's low with a long black marubozu @ 0.46 (-0.075, -14%) with high volume done at 35.6m shares on 3 May 2013. Immediate resistance @ 0.49, immediate support @ 0.445, next support @ 0.41. Always pay special attention to LONG white/black marubozu. it's sending a strong signal that BBs RUN ROAD. What matters to me most is that, you've grasped the basics of TA in such a short period of time, which I had spent alot of time, effort and money to get it. It goes to show that although you're young and inexperienced but you've effectively used TA as a defensive tool to protect/preserve your capital/profit and aggressive enough to trade any stocks when the major trend is crystal clear. Lastly, don't be afraid when you're wrong, it's part and parcel of the game. AusGroup has issued a profit guidance for its 1Q ended 30 Sep 2013. Just a follow-up on AusGroup even though you're no longer vested in this stock. 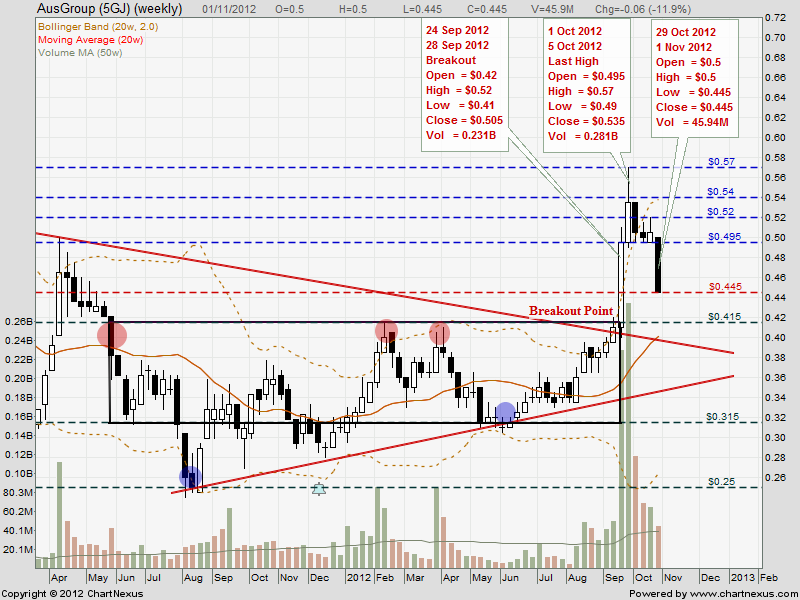 AusGroup closed with a bearish two crows chart pattern @ 0.325 on 4 Oct 2013 prior to its suspension. Immediate resistance @ 0.34, immediate support @ 0.285, next support @ 0.21. AusGroup closed with a "dark cloud cover" pattern @ 0.40 (-0.01, -2.4%) on 23 May 2013. Immediate resistance @ 0.43, immediate support @ 0.385, next support @ 0.36. 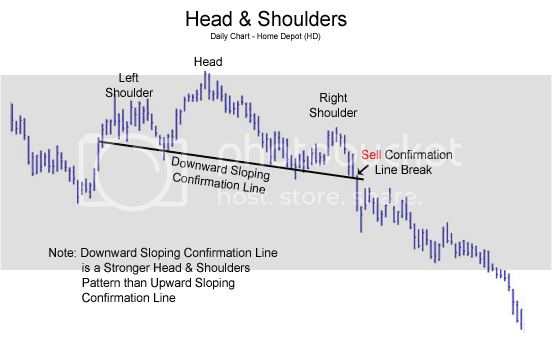 LONG the strongest uptrend stocks; SHORT the weakest downtrend stocks. For downtrend stocks; extremely high volume though preferable but not required as the share price will fall/collapse by its own weight. AusGroup has a hammer @ 0.395 (-0.01, -2.5%) on 21 May 2013 at 1.15pm. Immediate resistance @ 0.43, immediate support @ 0.36. AusGroup closed with a hammer @ 0.41 (-0.01, -2.4%) on 17 May 2013. Immediate resistance @ 0.43, immediate support @ 0.39, next support @ 0.36. AusGroup has an inverted hammer @ 0.48 on 9 May 2013 at 1125 hrs. Immediate resistance @ 0.505, immediate support @ 0.465. AusGroup has revealed the details of the next key step towards its relisting onto the ASX. The RTO companies will be Kebun Sedenak Sdn Bhd and Tropik Sentosa Sdn Bhd (Target Group), whose assets include freehold land and a golf resort in Malaysia. "As insufficient information was disclosed, our valuation of $0.66 is for AusGroup only, and we leave as potential upside any incremental value arising from the RTO," says OSK DMG in a note. The Target Group owns about 1,015 acres of freehold land in Iskandar Malaysia and intends to acquire another 47 acres for a total of 1,062 acres. They also own The Legends Golf & Country Resort, which is a master-planned resort comprising one 18-hole Jack Nicklaus-designed championship course, one 9-hole Arnold Palmer-designed course and other assets. The main business of the Target Group after the RTO will be property development and management. The Target Group’s shareholders include the Oh family which owns The Legends Fort Canning Park, Hotel Fort Canning, and is linked to the Eng Wah Global Group. Another big name is The New World Group from Hong Kong, a conglomerate with HK$311 billion in assets. The ASX listing will i) offer AusGroup additional currency to pursue M&A opportunities in Australia, ii) improve its access to funds and banking arrangements being listed in a market with investors familiar with its operating environment, iii) increase its profile and enlarge its client base in Australia, and iv) increase its currency to retain staff via share schemes. As such, we see continued impetus for management to complete this relisting process. After current shareholders receive distributions in specie of the ASX-listed Austco shares, the SGX-listed AusGroup will contain only Target Group assets. "Without sufficient information to fair-value these assets, we leave as potential upside any incremental value from the land and golf resort, and maintain our BUY on AusGroup at a TP of $0.66," says OSK DMG. AusGroup has a hammer @ 0.445 (-0.015, -3.3%) on 6 May 2013 at 1326 hrs. Immediate resistance @ 0.47, immediate support @ 0.425, next support @ 0.41. 1st appearance of a long black marubozu in Ausgroup's chart; expect more downside than upside for both AusGroup & Genting. 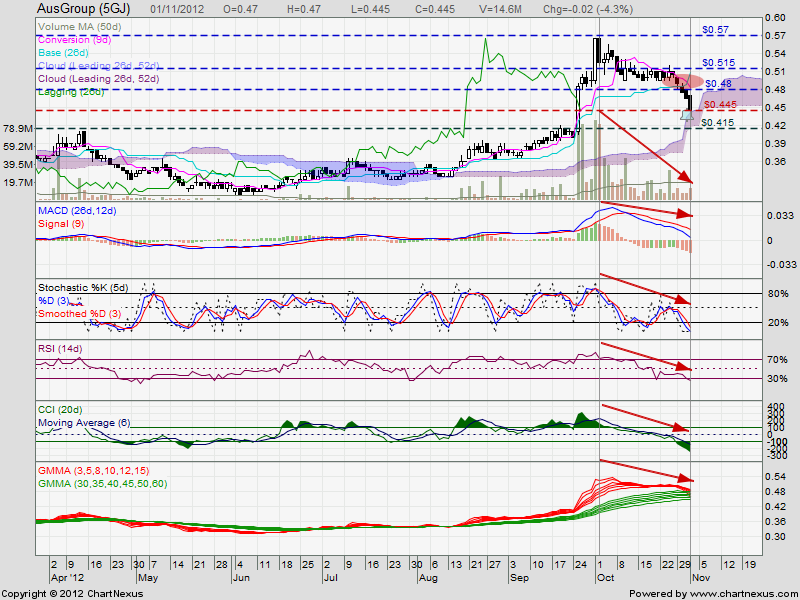 Genting's gap-down early this morning contrubuted to the STI's pullback today as it's an Index stock. A white marubozu without any upper and lower shadows（白色光头蜡烛) is a +ve pattern which indicates that the bulls win the bears. A black marubozu without any upper and lower shadows（黑色光头蜡烛) is a -ve pattern which indicates that the bears win the bulls. AusGroup plunged to low of 0.465 with a long black marubozu with extremely high volume done at 20.6m shares on 3 May 2013 at 1231 hrs. Immediate resistance @ 0.49, immediate support @ 0.465. AusGroup closed unchanged with an inverted hammer @ 0.525 on 19 Apr 2013. Immediate resistance @ 0.54, immediate support @ 0.51, next support @ 0.49. AusGroup closed unchanged with an inverted hammer @ 0.51 on 22 Mar 2013. Immediate resistance 0.54, immediate support 0.49. AusGroup closed with a hammer @ 0.53 (-0.005, -0.9%) on 28 Feb 2013. Immediate resistance 0.54, immediate support 0.515, next support 0.49. AusGroup closed with a spinning top @ 0.535 (-0.01, -1.8%) on 26 Feb 2013. Immediate resistance 0.58, immediate support 0.535, crucial support 0.515. 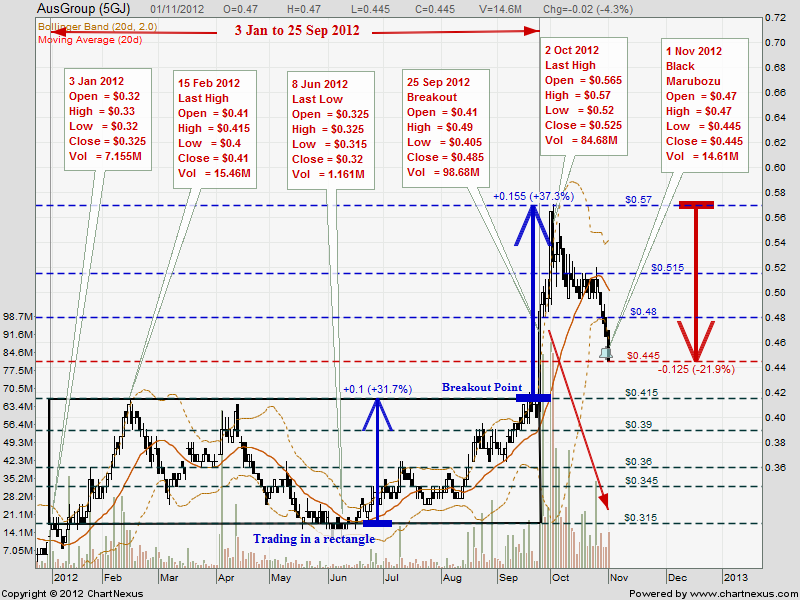 AusGroup closed with a black marubozu @ 0.545 (-0.005, -0.9%) on 25 Feb 2013. AusGroup closed unchanged with a hammer @ 0.55 on 22 Feb 2013. Earnings Commentary: AusGroup’s Strong Numbers A Sign Of Things To Come? Talk of an end to the mining boom has created a bit of nervousness regarding the outlook of Australia. But in reality, resource companies such as AusGroup are still able to churn out viable financial report cards. This is evident in its latest financial report where AusGroup reported a 9.8 percent year-on-year increase in net profits. On a year-on-year basis, AusGroup’s revenue for the half-year ended 31 December 2012 grew 11.8 percent (A$306.8 million versus A$274.4 million) on the back of increased revenue from the firm’s project and fabrication divisions. The company experienced increased activity on the back new project developments and expansions in both the oil and gas and mineral resources market. Net profit growth was slightly pared as the firm executed lower margin contracts as well as additional costs incurred during contract settlements. Net profit for 1H13 stood at A$9.1 million, a 9.8 percent improvement over 1H12’s A$8.3 million. In conjunction of the release of its financial report, AusGroup also said that its order book as at 14 February amounted to a strong A$308 million. The strong pipeline of projects represents some visibility in terms of financial performance in the future. Since the beginning of January 2013, AusGroup has begun to see gaining momentum on contract wins. This slew of contract wins have boosted the value of contract wins to at least A$62 million in the month alone. The latest contract development announced by AusGroup was an extension of an existing contract with Apache Energy in Australia. ASX Dual Listing To Unlock Value? Perhaps a pending development could grab the interests of value investors more. This development centers around the eventual dual listing on the Australian Stock Exchange (ASX). In an interview with analysts from OSK Research, the company’s management said that dual listing plans were proceeding smoothly even though no dates have been fixed yet. In the absence of a fixed timetable however, analysts still feel the impetus for the dual listing will remain strong. This belief stems from an assumption and conclusion that AusGroup is currently undervalued. Comparing the two main pricing ratios between AusGroup and its locally listed peer, CIVMEC, we can obviously see the stark difference. With some form of earnings visibility for investors in the form of a robust order book, could this pending dual listing unlock value for shareholders? Ausgroup: 2Q13 revenue flat at A$151m, earnings declined 46% y/y to A$2.8m. EPS at 0.6¢ for 2Q13, vs 1.1¢ for 2Q12. Operating costs for 2Q13 increased 30.5% to A$5.8m, mainly due to additional costs associated with the new Queensland region, as well as the Subsea Pressure Controls business which was acquired in Dec 2011. Mgmt stated that the oil and gas, LNG, coal seam methane and iron ore mine development sectors continues to be positive. Sustained demand from its clients, particularly in the LNG sector over the next few years should continue. Ausgroup's total outstanding order book stands at A$308m as of 14 February 2013. As a comparison to Civmec's results, 1H13 saw Ausgroup's revenues up 11.8% y/y, vs Civmec's 103% increase; 1H13 saw Ausgroup's earnings up 10% y/y, vs Civmec's 52% increase; 1H13 Gross margins for Ausgroup is 12.0%, vs Civmec's 15.6%; 1H13 EBIT margins for Ausgroup is 4.7%,vs Civmec's 10.8% Ausgroup trades at 9.4x P/E vs its next closest peer Civmec at 20x. The discount on valuations that Ausgroup is trading at is a reflection on the mgmt quality/ execution, orders, and growth. Singapore-listed AusGroup disclosed late Wednesday that through its subsidiary AGC Industries, it has been awarded an extension of its existing contract with Apache Energy for ongoing works on Varanus Island and associated offshore facilities. Valued around $16 million, scope of works involves mechanical services, sheet metal fabrication, scaffolding and rigging and instrumentation and electrical services. AGC will also provide minor capital works services including the fabrication and installation of pipe and structural work, roofing and wall cladding, painting and protective coatings, piping and, electrical upgrades. AGC's involvement on site will extend to shutdown works. Commenting on AusGroup's expected performance moving into the rest of 2013, OSK Research's analyst Lee Yue Jer said: "We continue to expect a good order win momentum." Located off the northwest coast of Western Australia's Pilbara region, the Varanus Island Processing Hub consists of oil terminal facilities, gas processing trains, low temperature separation and stabilization as well as gas compression, water treatment and reinjection. AusGroup subsidiary AGC Industries Pty Ltd, the Australian based construction and fabrication company, announced it has won additional fabrication work to the value of A$20 million ($25.9 million) on the Chevron-operated Gorgon Project, taking the total contract value to more than A$70 million. AGC’s scope of work involves high specification fabrication of stainless and carbon steel pipework, non-destructive testing, post weld heat treatment, blasting and LNG specification painting related to the LNG modules for trains 1-3 on the Gorgon Project. Fabrication will be undertaken at AGC’s manufacturing and fabrication facilities in Kwinana and Henderson, Western Australia. With this contract award, AusGroup’s order book now stands at A$280 million. AusGroup closed with an inverted hammer @ 0.655 (+0.01, +1.6%) on 18 Jan 2013. Immediate support 0.63, immediate resistance 0.68. AusGroup greeted the New Year softly with a A$13 million contract announcement for fabrication work with Fugro-TSM for Woodside’s Greater Western Flank (GWF) project. The project is for the fabrication of post metrology subsea spools for the first phase of the project which will commence immediately for a period of 12 months. This is expected to create work for 30 new staff based at the Australian Marine Complex. The A$2.5 billion GWF Phase 1 project is an extension of the North West Shelf project, and will develop the Goodwyn GH and Tidepole fields. We are not worried about the small dollar value of this contract. In Australia, it is common business practice to enter into a project with a small amount of work, and later as the quality of work is deemed satisfactory, more contracts will be awarded to the contractor. We expect this contract to grow in the same pattern. This is equivalent to about 4.4 months of work by our FY13F revenue forecast. Though slightly low, we understand this to be the period where contracts start flowing in. Case in point: At end-FY11 AusGroup had a A$264 million orderbook, and went on to deliver A$632 million of revenue in FY12. Our target price is based on 9x FY13F EPS, which we believe to be a conservative multiple for the 33 per cent EPS growth we are projecting on top of last year’s record A$23.3 million profit. Tuesday’s close of S$0.585 values AusGroup at a historical/forward P/E of 9.4x/7.0x, a P/B of 1.3x, and a FY13F EV/EBITDA of 3.0x. In contrast, Singapore-listed comparable Civmec is trading at 19x historical EPS, and a P/B of 6.4x. We believe that there is plenty of upside for AusGroup to close these valuation gaps. Resistance 0.425, immediate support 0.39, next support 0.37. 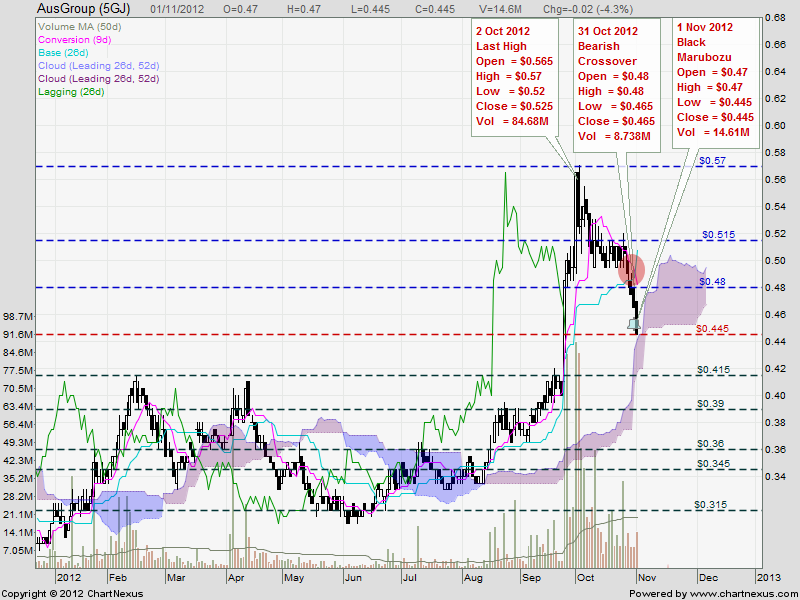 AusGroup closed with a black marubozu @ 0.445 (-0.02, -4.3%) on 1 Nov 2012. Immediate support 0.415, immediate resistance 0.48. There is a bearish divergence between the price and volume of AusGroup after the breakout on 25 Sep 2012. AusGroup closed with a 'dark cloud cover' @ 0.545 (-0.005, -0.9%) on 5 Oct 2012. Strong resistance 0.58; immediate support 0.515.